Traditional stone cottage with sea views, peace and quiet. 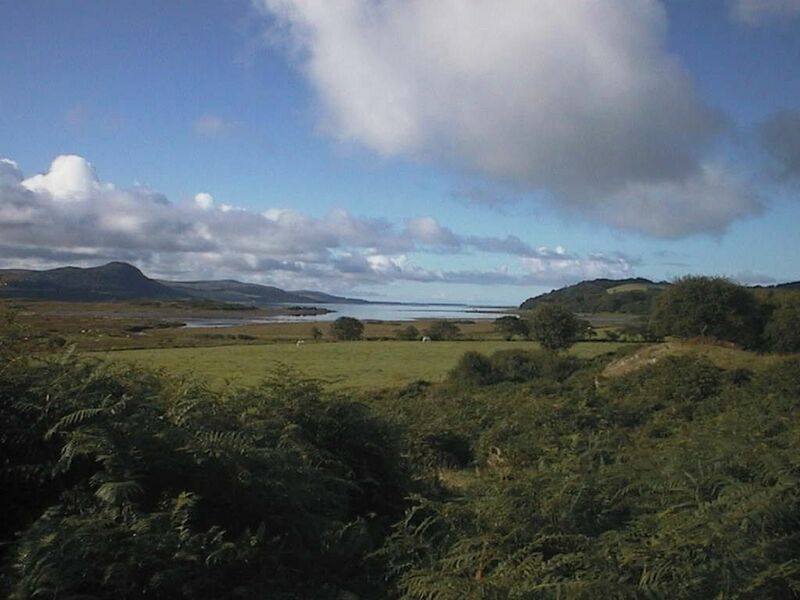 Barr na Criche Cottage (Self Catering Cottage) is peacefully situated a two minute walk from Barr na Criche House (a separate Bed & Breakfast), with views to West Loch Tarbert and Kintyre. The cottage has one double bedroom and one twin bedroom, both with built in wardrobes. The twin room has furniture which was used by the Olympic Athlete's at the London 2012 Olympic Village, you never know which famous Gold medalist may have slept on them before! The bathroom is between the two bedrooms and has a lovely old fashioned cast iron bath and a walk-in shower. The spacious hall way leads to the utility room which has a washing machine and there is a tumble drier up at the main house which is available for guests use. The kitchen is well equipped and includes an electric cooker, microwave, fridge/freezer and plenty storage room. The archway leads through to the spacious lounge/dining room. The wood burning stove burns wood and peat which is included in the price of your stay. Satellite TV and a DVD player are available as well as a large range of books and games. The separate B&B at Barr na Criche House is a two minute walk away. The large en suite B&B room can be set as a twin, double or an extra bed can be added for a third person. This is a delightful room which opens out onto the balcony from where you can sit and watch the world go by, with views of the West Loch and Islay ferry as it sails by several times a day. The en suite bathroom has a walk-in shower and large bath, and guests are given a hearty breakfast served from a table beside the picture window with wonderful views, across from the balcony. There is plenty of walking in the area, the fishing village of Tarbert is nine miles away and a little further are the terminals for catching day trips on the Caledonian MacBrayne ferries to the Islands of Gigha, Arran or Islay & Jura. You might just wish to relax down at the sea, a ten minute walk from the cottage, in your own Beach Hut which is well equipped for BBQ's, bucket & spade ventures etc., The well known Kilberry Inn is four miles from the cottage, serving the most delicious gourmet meals. Pet lambs, Treacle the shetland and Peanut the pony graze nearby. A great base for a family holiday. Linen, towels and electricity are included in the price. Three night short breaks are available between November and March (excluding Christmas & New Year) however, always ask for availability if unsure. There are several golf courses. The closest is Tarbert Golf Course, this is nine miles away and has nine holes. Lochgilphead Golf Course is approximately 20 miles away, with the bigger international course at Machrihanish about 40 miles away. Notes on accommodation: The Self Catering Cottage and B&B benefit from central heating and plenty of hot water! Outside: The cottage and B&B have ample car parking space and are surrounded by woodlands which make an excellent play ground for children. The cottage is fenced off from the fields where the owners ponies and family sheep graze peacefully. In the cottage garden there is a BBQ, garden table and chairs and a garden hut for storing your bicycles. Up at the main house there is a BBQ, shed for bicylces and decking funiture for B&B guests use. Guests are able to use the Beach hut down at the sea shore. Arriving late on a Friday night we were met with the most beautiful country cottage. Straight in to start the fire and with no phone signal to the outside world it was bliss. Woke up Saturday to stunning surroundings and the cottage has everything you need to be comfortable. It feels like a proper escape from the world and we would love to return one day. Wonderful homely cottage with everything you need, the kitchen is well stocked, and there is a good selection of dvds and books. The owners leave you to it, but are amazingly helpful if needed. We had a 15 year old and a 12 year old with us and they didn't miss the Internet at all. There was so much to do from exploring the woods, to playing in rockpools to swimming in the loch, where we were lucky enough to be joined by seals. I would highly recommend this cottage if you want some peace and quiet and family time together in an absolutely amazing location. A truly special place. Lovely hosts who leave you to it. Cottage is reasonably well equipped. Great setting - no noise other than nature most of time. Thoroughly recommend if you want to get away from it all and/or don't mind travelling to see the sights. Very limited internet - bliss after the initial shock. Perfect and so cosy ! We felt in love with the cottage and its surroundings! Perfect, cosy, very well-equipped.. and the owner is so Kind ! We recommend to all nature and lovely cottage lovers ! Es war leider viel zu warm für diesen Zeitraum, so dass wir nicht den Aufenthalt im Garten, wegen den kleinen Stechmücken nicht so genießen konnten. Nichts desto trotz fühlten wir uns in diesem Cottage sehr wohl. Das Cottage ist mit allem ausgestattet, was wir für den Aufenthalt benötigten und fühlten uns von Mr und Mrs Minshall gut betreut. From Glasgow M8 come over the Erskine Bridge, follow signs A82 to Loch Lomond, at Tarbet follow A83 to Inveraray, Lochgilphead and Tarbert (Loch Fyne) A mile South of Tarbert take B8024 signed Kilberry, turn left at the golf course (signed Kilberry) and follow single track road for approx. 8 miles. Barr na Criche is signed on the left, if you get to the Ardpatrick turn off you have just missed our turning. A lovely alternative route is to come to Tarbert by ferry. Please ask for details. Glasgow Airport to Barr na Criche by car is approximately a two and a half hour drive. There is car hire at the Airport. Lochgilphead is the last chance for fuel before getting to Barr na Criche. If you come from South Kintyre the village of Clachan, 20 minutes South of Tarbert is the last chance for fuel. The pretty fishing village of Tarbert is a twenty minute drive from Barr na Criche. Kennacraig ferry terminal is a forty minute drive. Barr na Criche looks across to West Loch Tarbert. A ten minute walk takes you to the waters edge and onto the Beach Hut which is available for your use. The fishing village of Tarbert (nine miles away) has its own ruined castle which sits above the village. A short walk will take you to the Castle from which you can get a good view of the village. The village has several good Pubs and restaurants, butcher, baker, fishmonger, chemist, supermarket and various small shops. There is one Bank of Scotland and the local Tourist Board. There is no fuel station in Tarbert. Booking Notes Changeover Day: Cottage changeover day is normally a Saturday. Departures by 10am and arrivals after 4pm. However, out of season we offer short breaks over weekends, mid week or to suit your schedule. Please let us know your requirements and we will try to be flexible. Notes on prices: Short breaks are available at Barr na Criche Cottage from November until March, subject to availability. A three day short break, electricity, linen/towels and logs included from £300. Short breaks at the B&B are also available.